Check out what one little leader had to say. This kid is going places! Fantastic that Unbeaten is so powerful and accessible at the same time that an 11 year old can get the essence of the message and put it in a nutshell. Good on Ahmed and good on Polaris and the whole team responsible for Unbeaten. Wow – that is so wonderful. It is a pleasure to read such extraordinary things coming from our products – proud to be a part of it. My partner is a quadriplegic and each day he inspires me with the time and effort he puts into doing the things we take for granted. I can shower, get dressed, grab breakfast and be ready to leave the house in 30mins – it takes him an hour to get himself out of bed,showered and dressed – before he even starts to get himself breakfast… (I do often get him breakfast – but he does have an independent streak!). He watched Unbeaten and it has inspired him!! He is now trying hand cycling. It can be harder for quads as they don’t have the same amount of agility and balance as paras… Also – with a spinal injury – your body thermometer stops working – so if you over heat – you die – we are so lucky and dont even know it… yet these people continually achieve and amaze. Hi Merna, thanks for posting your message. It got me all choked up. You are right, so many of the basic things we tend to take for granted. I would love for you and your partner to keep us updated with how the hand cycling goes. Oh wow 11yrs old, what an awesome kid, HE IS INSPIRING!, i love that our Polaris Global education impacts the children of our world, whether it’s from the DVDs or our Beyond Freedom Evolution. IMAGINE this beautiful world with children like Ahmed, who have been inspired in this way to KNOW not to settle for excuses and limitations. What an awesome world we ARE EVOLVING to. 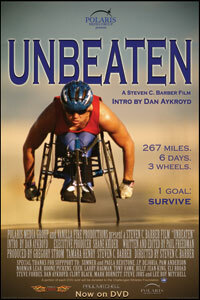 Have watched this movie a few times, very inspiring and loved it.